Vivaldi is a web browser built on Chromium that includes all of your standard Internet browser features with a few extras. One thing about Vivaldi worth noting is its very different user interface. 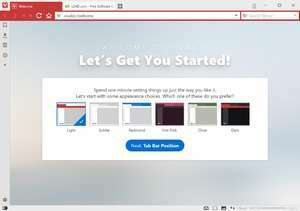 Though it contains all of the typical features and general layout of other browsers like Google Chrome or even Firefox, Vivaldi has a different color scheme which can be fully customized. Apart from the different design of Vivaldi, it also as a feature which can organize tabs into stacks. Version 2.4.1488.38 is a freeware program which does not have restrictions and it's free so it doesn't cost anything. For security reasons, you should also check out the Vivaldi download at LO4D.com which includes virus and malware tests. Additional screenshots of this application download may be available, too.